The Fraunhofer Heinrich Hertz Institut (HHI) is at the forefront of optochip and photonic integrated circuit (PIC) research. 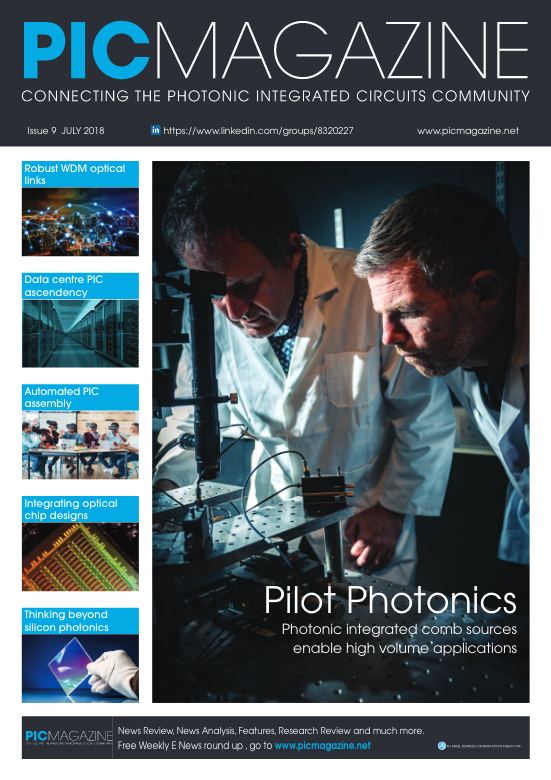 Executive Director Martin Schell provides insight into the Institut's latest work with EMLs, EAMs and Mach-Zender modulators between 25 and 100 GBit/sec. "Annual global IP traffic will reach 3.3 Zbyte per year by 2021"¦.." This forecast recently published by Cisco  looks like a huge market for transmitters, and receivers alike. On a closer inspection, however, optical component makers may get less excited. Thanks (or owing) to fantastic achievements on the high-speed performance of key components in recent years, single transmitter devices of fairly manageable design are capable today of delivering a modulation rate on the order of 50 Gb/s -100 Gb/s, and even beyond that when using more complex configurations. Much of the IP traffic ends in data centers. Their typical architecture requires top-layer intra-center optical connections of 500 m to 2 km distance, and of up to 40-80 km between such facilities. Single-mode operation is of course compelling here. A simple calculation reveals that supporting a yearly data volume of 3.3 Zbyte, equivalent to an average data rate of about 8.3x1014 bit/s, would "“ theoretically "“ only need some 16,000 pieces of 50 Gb/s transmitter chips. With electro-absorption modulated lasers (EML), outlined below, these could be accommodated on a single wafer of 3-inch diameter, today's standard size in InP technology. In the end, the situation will not be as bad like that: One north-south bit may cause hundreds of east-west bits; the same bit may pass a couple of transmitters; and data centers should be equipped to handle peak traffic. A recent analysis of AIM Photonics Academy  concludes that for the data centers operated by the four giants: Amazon, Facebook, Google, and Microsoft, there will be a demand of approximately 22m pieces of 100 Gb/s transceivers per annum, translating into a lower 4-digit 3" wafer quantity. With 8 wafers grown in a single run, this would correspond to about 150 of 4-hour epitaxy runs per year for the base wafer. Silicon Photonics (SiP) is being widely regarded as the technology of choice for implementing intra-datacenter transceivers using electro-optic modulators for data generation. Despite tremendous progress made during the past years, SiP is lacking the ability to make practical Si-based lasers, and in fact there is no solution in sight. Consequently, InP-based source lasers have to be incorporated, either by demanding hybrid assembly techniques or by a hetero-integration (e.g. wafer bonding) approach. While the former represents a serial manufacturing process the latter requires additional on-wafer InP processing which questions the economic advantages of the Si core technology. InP technology, on the other hand, provides the only material platform enabling true monolithic laser integration. This enables extremely efficient and small-footprint ultrahigh-bitrate transmitter chips. Whereas directly modulated DFB laser devices may be useful up to 25 Gb/s, EML structures are predestined for achieving much higher modulation rates and concomitantly higher transmission distances, thanks to the adjustability of zero and even negative modulation chirp. Fraunhofer HHI has been pursuing an intense program to develop EMLs over almost a decade. A fairly simple design has been adopted that uses an identical layer structure for both the DFB source laser and the electro-absorption modulator (EAM). The active region consists of InGaAlAs quantum well layers. With etching an isolation trench between the DFB and the EAM section as a key manufacturing step on top of standard lasers, EMLs now have developed into reliable high-yield devices . Typical performance parameters of HHI's EML devices, featuring a 300 Âµm long DFB laser and an 80"¦120 Âµm long EAM section, are characterized by a static extinction ratio of > 20 dB at an EAM voltage swing of 2 V. A typical bias voltage is about -1 V, and below this point the chirp factor tends to become zero, and even negative when further shifting the bias towards larger negative values. The optical output power reaches some 5 dBm, generally limited by the fact that the DFB laser is not operated at optimum gain but is detuned to longer wavelengths to guarantee transparency of the electro-absorption modulator in the on-state. To overcome that design-inherent issue, an optical booster amplifier has been added (Fig. 1) which provides output powers of >10 dBm. Even at 56 Gb/s the integrated amplifier does not affect the modulation behavior . Figure 1: Top view of HHI's EML chip comprising an optical amplifier (OA) section to boost the output power. All of the three sections (DFB, EAM, OA) are made of the same layer structure, with electrical separation between them achieved by isolation trenches. The optical output is tilted to help suppress optical back-reflection. RF feeding of the EAM part is supported by a Ground-Signal-Ground (GSG) transmission line. Thanks to this upgrade, next-generation PON requirements (average modulated output power of min 9 dBm @10 Gb/s; 1577 nm) can readily be met. The modulation rate of 56 GBd is routinely achievable now. However, a baud rate of 100 GBd has been demonstrated very recently (Fig. 2) after introducing further design refinements. Hence, a single-wavelength 100 G transmitter (on-off keying) may be implemented using a single tiny EML chip, provided suitable electrical drivers are available. In addition or instead, however, virtually all the common multiplex methods are applicable to efficiently accomplish even higher data rates and/or to exploit lower baud rates. 4- and 8-level Pulsed Amplitude Modulation (PAM) was successfully demonstrated on HHI's EMLs. Using a proprietary SiGe based driver IC, clear 32 GBd PAM4 eye diagrams have been achieved at a driver power of 84 mW leading to a figure-of-merit of 1.3 pJ/bit (Fig. 3).